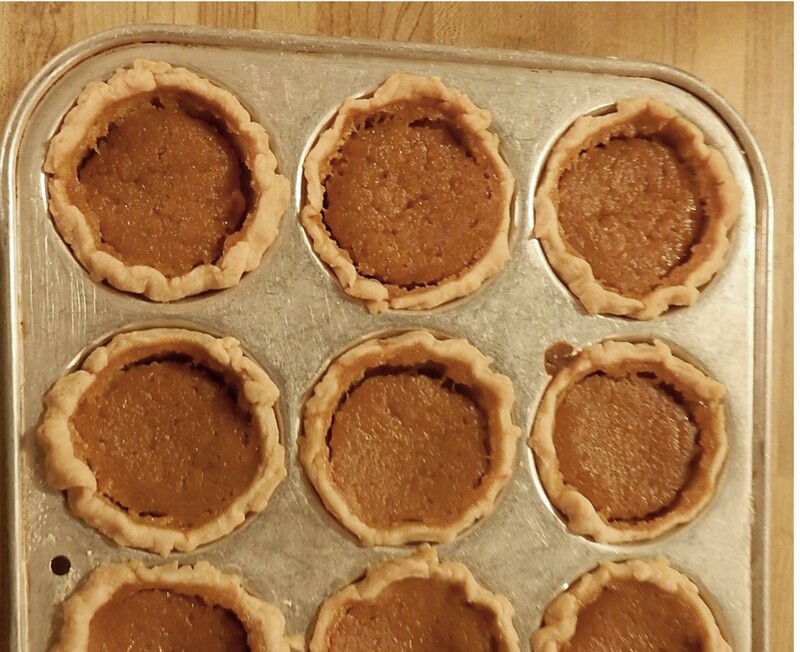 ‘Tis the season for pumpkin desserts, so when I saw a hundred-year-old recipe for Little Pumpkin Pies, I knew that I had to give it a try. Ginger and a small amount of molasses blend wonderfully with the pumpkin to create a lovely taste sensation. This recipe does not call for any cinnamon, but I never missed it. So often dessert servings are huge. 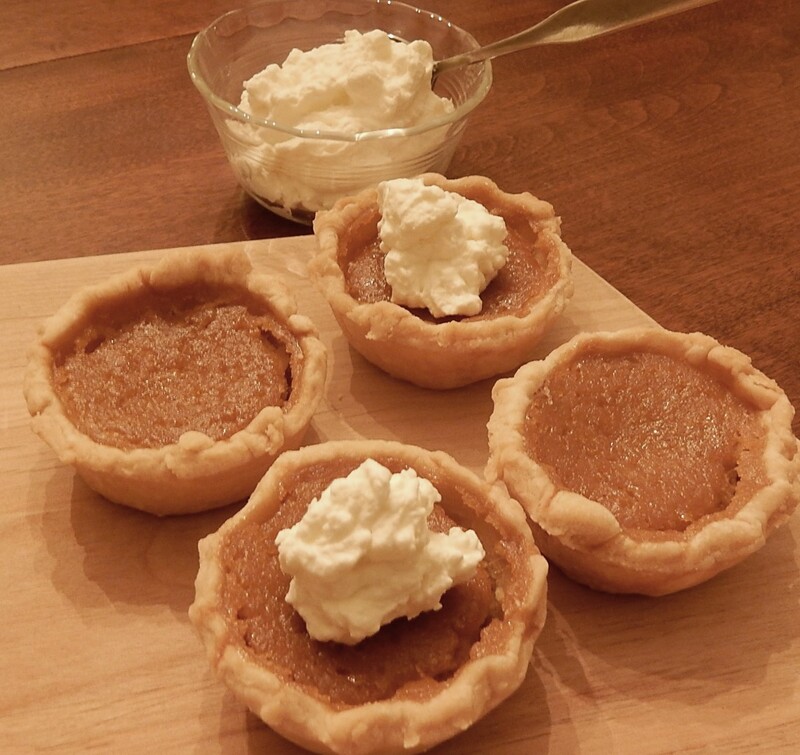 These Little Pumpkin Pies are perfect when something smaller is called for. The old recipe suggested serving the Little Pumpkin Pies with whipped cream that is flavored with vanilla or almond extract. These pies are great by themselves – and probably would be fine with commercial whipped cream – but I highly recommend taking a few extra minutes to make homemade whipped cream. It really enhances the old-time goodness of these Little Pumpkin Pies. Preheat oven to 425° F. Combine pumpkin, sugar, molasses, eggs, ginger, salt, butter, and half and half in a mixing bowl; beat until smooth. Spoon into pie crusts. Bake 15 minutes; then reduce heat to 350°. Continue baking (for another 15-30 minutes) until a knife inserted in the center of a pie comes out clean. Remove from oven and cool slightly. Remove pies from pans. If desired, serve with whipped cream (see recipe below). *Note: I used fresh pumpkin, but 3/4th of a can of pumpkin (14-16 oz. can) could be used. To prepare the fresh pumpkin for the pie, I peeled part of a pumpkin and cut it into one-inch cubes. About 1 3/4 cups of cubed pumpkin will make a cup of cooked pumpkin. I put the cubed pumpkin into a saucepan and covered it with water. I turned the heat to high and brought to a boil; I then reduced the heat to medium and cooked until tender (about 20 minutes). I drained the pumpkin and used my mixer to blend it until smooth. I then proceeded with the pie recipe. Fresh pumpkin can also be roasted. Cut the pumpkin in half and remove seeds and membranes, then put it in the oven at 400° F. Bake for about an hour or until the pumpkin is tender. Remove from oven. When the pumpkin has cooled, remove the pulp from the pumpkin shell. Use mixer, blender, or food processor to blend the chunks of pulp until smooth. Proceed with the pie recipe. Place the whipping cream in a bowl and beat until stiff peaks form. Add confectioners sugar, and vanilla or almond extract. Continue beating until thoroughly mixed. Posted on November 11, 2018 November 10, 2018 by SherylPosted in FoodTagged pie, pumpkin, recipes. These are so cute and I’ll bet they’re delicious, too! I love everything pumpkin, so these are worth a try. Do you think they could be done the same way in those tiny muffin tins, with the baking time reduced? I can’t imagine why it wouldn’t work. I’m sure that this recipe would work just fine with a tiny muffin tin if you adjusted the time. Depending upon the size of the individual pies, there could be a lot of variation in cooking time. The beauty of experimentation in the kitchen is that the cook gets to eat the failures! 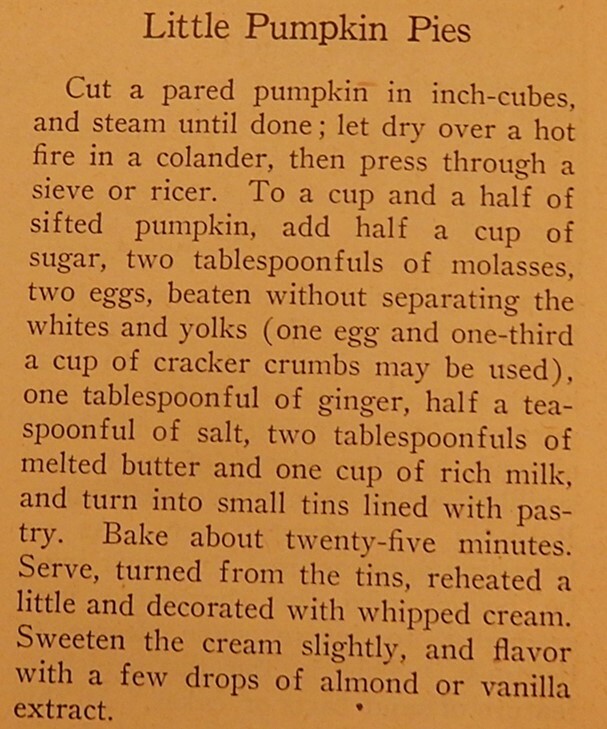 How interesting to do a recipe from so long ago; they look delicious! They’re tasty. They knew how to eat a hundred years ago. There are a lot of good recipes from era. Small desserts are always great. A lot of times people don’t want a whole piece of pie after a big meal. I can’t eat crust, so I made little pumpkin flans and had to fight my family for them. The little pumpkin flans sound wonderful. I can see why your family liked them. I tblsp of ginger seems a lot. Won’t it dominate too much? The amount of ginger seemed like it worked in this recipe. I think that the inclusion of molasses balanced the ginger. I guess it did. I’d like to try. These are the sweetest looking little pies I ever did see. I like molasses and I like pumpkin. I might need to give these a try. Thanks. Oh yum. Love pumpkin desserts! I would like one right now . . . . I simply won’t have time to fiddle with tiny pies, but I always bake daughter Lise a pumpkin pie when she comes for Thanksgiving. I’m going to add ginger and molasses this year. Great idea! The ginger and molasses add a nice flavor to the pie filling. When I made these little pies, I wasn’t sure whether they were worth the extra effort – but they definitely were a major hit around my house and I’m thinking about making them again for Thanksgiving. The little pies were cute as could be, and as you noted, people like little bits of things. We’re having lots of people in the house starting the week before Thanksgiving, so I’m not going to do anything that takes extra time this year. Thank you, Sheryl. I hope you have a blessed one, too. Those look delicious! I love dessert, but I also hate the huge portions. All I really want is three or four bites of something sweet after a meal. Small pies are perfect. I was really pleased with how these pies turned out. They’re tasty. These are perfect for the holidays,would make a lovely display with a little bit on whipped cream on top! They really do make a nice presentation with a little whipped cream on top. I made pumpkin pie a few times, starting with a pumpkin. What did you think? Worthwhile? Or might as well used canned puree? I generally start with a pumpkin when making pumpkin pie. That said, my guess is that most people would be unable to tell whether fresh or canned pumpkin was used once the other ingredients were added. These are adorable! I love the tiny element of these. I also love the tiny element of these. I was really pleased with how they turned out. Wow that is a long time! They are so cute and look delicious! This old recipe turned out wonderfully. They are tasty and look really nice.